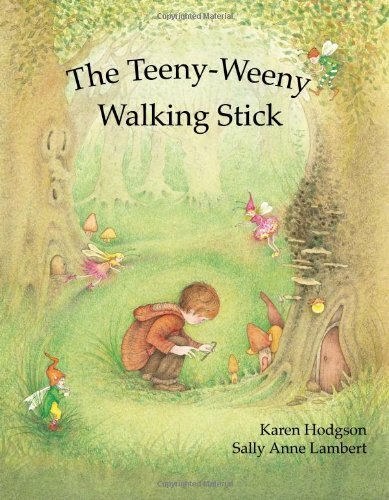 The Teeny-Weeny Walking Stick is a charming tale of innocence with an old fashioned quality to it, which both my six year old and I enjoyed. 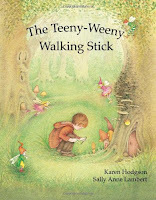 It's a pretty simple story, Edward is trying to convince his older sister Hattie that little people live at the bottom of the garden by bringing her teeny-weeny items such as a walking stick, hat, wings and slippers. But Hattie dismisses each and every one, it's a twig, an acorn lid, sycamore seeds and catkins. But Edward is firm in his belief, what can he do to prove it to Hattie? This book fully captures a child's imagination, they'll adore Edward and his belief in the little people, be outraged by his sisters cynicism and delighted by the ending which see's Hattie accept that Edward could be right after all. As an adult reading this to my child I appreciated the beautiful illustrations which reminded me of books from my own childhood books and the whimsical tale of innocence. 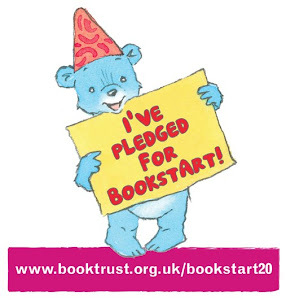 The story is simple enough to be enjoyed by very young children, and also has enough text to charm older children who can read alone. My daughter has read this book several times to herself over the last few days, as well as enjoying having it read by me. A lovely, magical book ideal for bedtime reading.